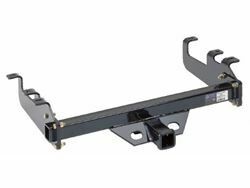 If you need a tow receiver go with the pros and install a B&W Class V trailer hitch with a gross towing capacity of up to 16,000lbs and a tongue weight rating up to 1,600lbs. This hitch will easily tow a wide variety of larger sized loads from boats and RVs to just hauling black dirt for the back yard. The B&W Class V hitch is made out of high quality steel with a three piece interlocking design with grade 8 mounting hardware and it has a six point frame mount for added strength and durability. This B&W hitch is an easy do-it yourself installation with custom instructions for your vehicle and is backed by a limited lifetime warranty, so if you're ready to tow we're ready to help you go. Tow with confidence - Tow safely - Tow with B&W - And remember to never exceed the tow ratings of your truck.